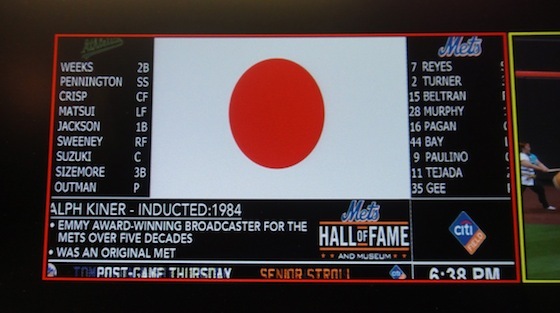 On June 21 the Japanese community of New York gathered at Citi Field in Flushing, Queens, home of the New York Mets, to celebrate the 2nd Annual Japanese Heritage Night. 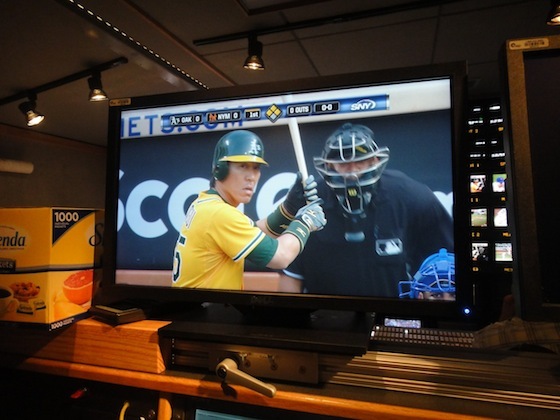 The Mets took on the Oakland Athletics, former Yomiuri Giants and New York Yankees outfielder Hideki Matsui’s current team. Before the game the Japanese Folk Dance Institute of New York and taiko drumming troupe Soh Daiko performed on the field. 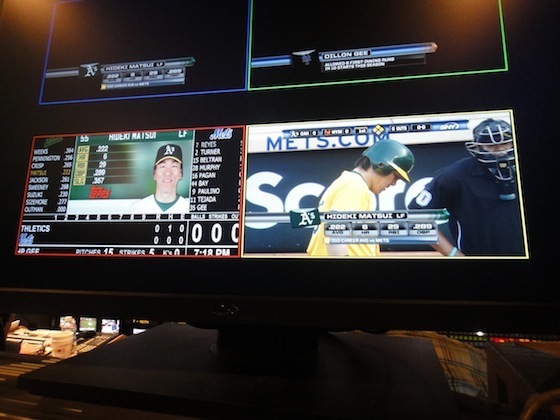 Since I’m a freelance Chyron operator for SNY, the network that broadcasts the Mets games, I was there, but in a television truck instead of in the stands. I couldn’t see the festivities on the field, but I took a few pictures of my monitors. 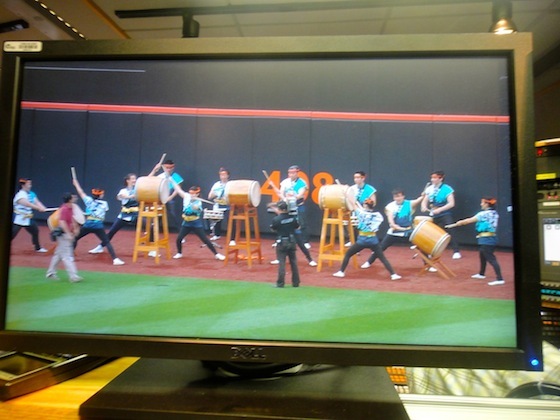 When Hideki Matsui came up to bat during the first inning, I was able to snap a quick photo of the monitor. The top two monitors are the outputs of the graphics machine I use. The bottom left is the scoreboard in Citi Field, and the bottom right is program, or what people see when they watch the game on TV. Matsui came up with the bases loaded and no out in the top of the first inning. He hit a sacrifice fly that scored one run. He would finish the night 1 for 2, with a single, an RBI, two walks, and a run scored as the A’s beat the Mets 7-3. 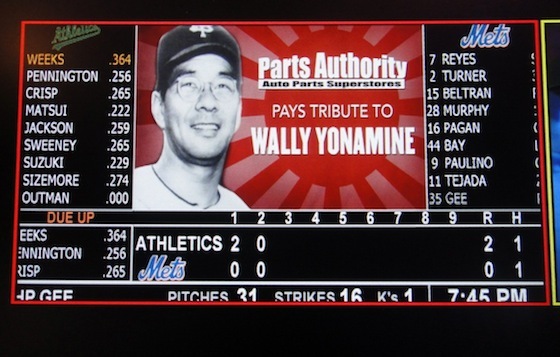 There was also a tribute to Wally Yonamine, the first American to play professional baseball in Japan. A Hawaiian of Japanese and Okinawan descent, Yonamine spent almost 40 years in Japanese baseball as a player, coach, and a manager. He was inducted into the Japanese Baseball Hall of Fame in 1994. He died in February of this year at the age of 85. The event wasn’t just a spotlight on Japanese culture; a portion of the ticket sales went to Japan earthquake and tsunami relief. Read about support from both within at outside of New York’s Japanese community for fundraising efforts from Examiner.com’s Justin Tedaldi.